Dek Hockey is an all-out, teeth-clenching stick-fest – Yet another Brain-Pad needed Sport! Contact Vic to get your league into Brain-Pads, and your winning streak rolling! Annie-Claude Daoust plays for the Crazy Chicks at Dek hockey Rive-Sud, in Ste-Catherine on the South Shore on Montreal. “I’ve played Dek Hockey for the past 15 years. I’ve been using the Brain Pad Low Pro for the past 2 years. It gives me confidence to play my sport safely, it’s very comfortable, easy to breath and I wear on every game”. Annie-Claude Daoust joue pour les Crazy Chicks dans la ligue de Dek Hockey Rive-Sud à Ste-Catherine sur la rive-sud de Montréal. « Je joue au Dek depuis les 15 dernières années. J’utilse le Brain Pad Low Pro depuis 2 ans. Il me donne la confiance de pratiquer mon sport de façon sécuritaire, il est très confortable, c’est facile de respirer avec et je le porte à tous les matchs ». 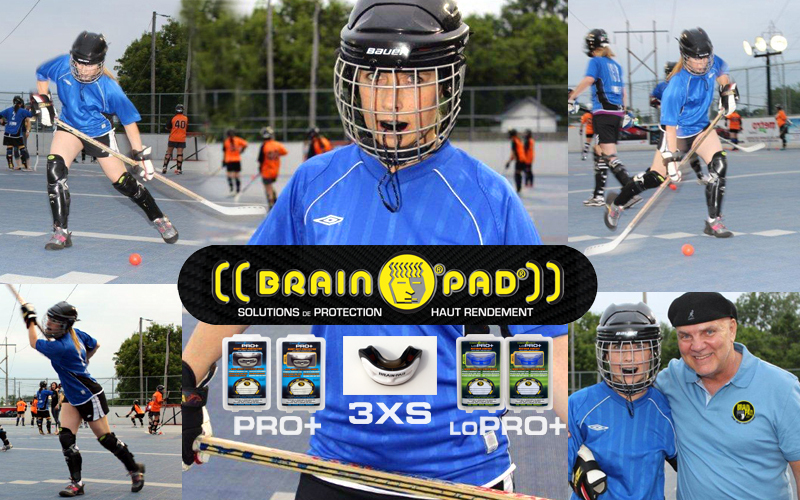 This entry was posted in Brain Pad Blog and tagged Brain-Pad, Brain-Pad needed, canada, Deck Hockey, Dek Hockey, double mouth guard, protective mouth guards, Rive-Sud, shin guards, Skate guards, teeth-clenching, Victor, Victor Theriault by admin. Bookmark the permalink.